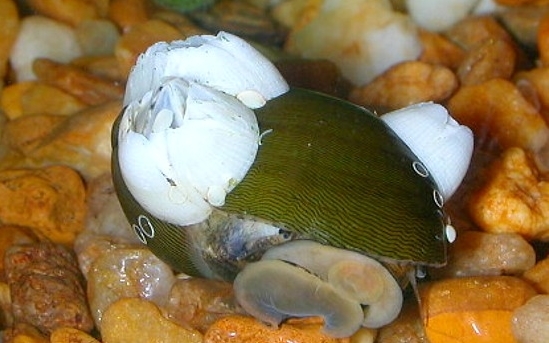 Data: This fresh-water snail and attached barnacle was purchased from a pet shop in New York. The pet shop owners don't know which supplier they got it from or what they have. Has anyone ever heard of or seen a gastropod or a bivalve for that matter, that lives in freshwater and has barnacles on them alive and fine? I look forward to hearing any ideas or positive identifications. This looks like one of those nerite species that can live in freshwater...my guess is that it came from brackish water where the barnacles could survive and that they will soon die in the freshwater aquarium. I am not an expert, though...so wait for the full answer from Maybe Tom E. (he's the Neritidae specialist, isn't he) or a barnacle expert?...Regards, Peter E.
It is definitely Vitta reclivata (usnea) as Henk said. This is a brackish-fresh water snail found within a mile of salt water, at least around here (Sarasota, Florida - West coast)...Peggy W.
The specimens from around here for the most part are so covered with barnacles that they aren't worth collecting. The illustrated specimen was collected some 15 miles from the ocean where they are dirt common. The mystery snail is the nerite, Vitta usnea (Röding, 1798) (common synonym Neritina reclivata). It is from the Caribbean and found in the US from Texas to Florida. I do not know the ID of the small barnacles...Tom E.
bay in water reported to have only about 3 parts per thousand salinity (about 1/10 that of seawater). A few estuarine species can live in freshwater without difficulty as adults but cannot maintain populations there because their reproduction requires at least brackish salinity. In the same area, these include the bay clam Rangia cuneata, and I would guess probably also the Carolina marsh clam, Polymesoda caroliniana. None of these are known to live in ordinary seawater. The common oyster Crassostrea virginica has just the opposite preference: It normally thrives in brackish water, but when predators are excluded, it does even better in fully marine salinity...Andrew K. R.
I have had a few specimens of Vitta usnea in a freshwater fish tank for a number of years now. It is actually just slightly brackish with about a tablespoon of salt per 2 gallons. I started with about a dozen and there are now only three - all quite large. They faithfully laid egg cases, but of course, without a true salt water environment the young veligers cannot survive and develop. This species is sold by a couple of different online aquarium supply houses as an algae control measure for freshwater tanks. They also sell Nerita funiculata and Vitta luteofasciata for similar control in salt water tanks. The only other nerite I have seen with attached barnacles was Vitta glabrata from Africa, also a freshwater dweller with a need for salt water in its development. I also have a couple of Clypeolum latissimum in a fish tank. They started out as juveniles of about 10-12mm but have grown in a year to almost twice that size...Tom E.
Funny, in 1990 I found a colony of these flourishing in a tributary of the Peace River, not too far from Shell Ck, Charlotte Co, Florida. The water is utterly fresh (pollution aside) anf with a good flow...Andrew G.
Yes, Vitta usnea lives in brackish to freshwater, one of several problems, questions, issues, etc. with this species. Say (1822, who named the species Neritina reclivata) wrote, "I found this species in great plenty, inhabiting St. John's river in East Florida, from its mouth to Fort Picolata, a distance of one hundred miles, where the water was potable." I would say 100 miles inland is pretty much beyond tidal influence and can be safely called freshwater. It has been listed by various authors as direct developing with crawl away juveniles. BUT, even this is unclear. According to Andrews (1935:42) this is one of the few nerite species with direct development. Specimens kept in small glass dishes laid eggs that hatched into miniature "crawl-away" adults bypassing the more typical veliger stage. This has not been observed in my aquariums. And, young Vitta usnea (<6 mm) were collected on turtle grass in three feet of saltwater off Gulf Breeze, Florida (Cheshire, 2004); indicating a tolerance for salt water. There may be two forms (there is certainly enough, though not dramatic, variation in radular and shell morphology), one that has evolved to a completely freshwater existence and the other that has remained diadromous - and is still tied to the sea... Tom E.
Sounds like a job for DNA analysis. Where is David C. when you need him? influence down near the bottom of the river due to the salt wedge. Salt water is heavier than fresh and as the tide comes in, the salt water slides in under the fresh water. So although the water is fresh at the surface, it is saltier near the bottom.....where many of the usnea live (but not all...as they are often found on tree trunks, etc. above the salt wedge). inland. If the land is very flat, the salt wedge extends further inland, and so does usnea. A steeper gradient keeps salt water and usnea confined closer to the sea. Limestone is very shallow along the west coast of north central Florida. In Dixie County the limestone is virtually right at the surface and fresh water seeps out of this limestone at low tide. I have found hundreds of usnea lined up along the limestone in the fresh water at low tide, with none even a couple meters above the fresh water intrusion.... This zone is covered with tidal water at high tide..... K. A.